Today’s a very special day! Right now, at this very moment, you are reading my 100th blog post! Wow! One hundred posts! Where in the world did the time go? It seems like just yesterday that I was spending all of my free time tending to my imaginary mafia. Change a diaper. Beg for untraceable cell phones and illegal transaction records. Play legos. Save up enough Thai Baht to buy a Nguhea Sniper Rifle. Clean up the play-doh that’s been rubbed into the carpet. Try to collect the last faberge egg for my Moscow collection. Console a crying baby. Spend 24 million rubles on a musk ox. All in a day’s work. Then, I abandoned my mafia and entered the blogosphere. Now I alternate between toys, cooking, temper tantrums, food photography, snuggling, recipe writing, laundry, editing, bath time, and menu-planning. I suppose that being The Gourmand Mom is a much more productive role than Mafia Wars Mom. So, you may be wondering what else has changed during these past 100 posts. Writing recipes feels a whole lot easier than the first few posts that I fumbled through. I hope they’ve become easier for you to follow. I’ve baked more bread products than I ever did in my pre-blog life. In fact, I had to buy a new cover for my dining room table, since the old cover seemed to be harvesting yeast which my three year old so kindly scattered across the table. I’ve gained back a couple of the pounds I worked so hard to lose. Going to have to fix that. But it’s been for a good cause and I had fun doing it. Perhaps I can file for some sort of blogger’s compensation for my troubles? My love of cooking has been completely reinvigorated. Having a forum for sharing recipes and stories about food has been truly fulfilling for me. Thank you for being my audience. Having an audience has forced me to add even more variety to my cooking. Since I’m guessing you don’t want to read about the same recipes every week. My children have become the most skilled toddler sous chefs. I think I need to find little aprons and chef’s hats for them. Through practice, my photography has become more purposeful. Now, rather than taking a hundred pics to get five that are post-worthy, I take about fifty. Though I’m still quite the novice photographer, I’m getting better at judging lighting and approximating camera settings. It’s been a fun hundred posts. 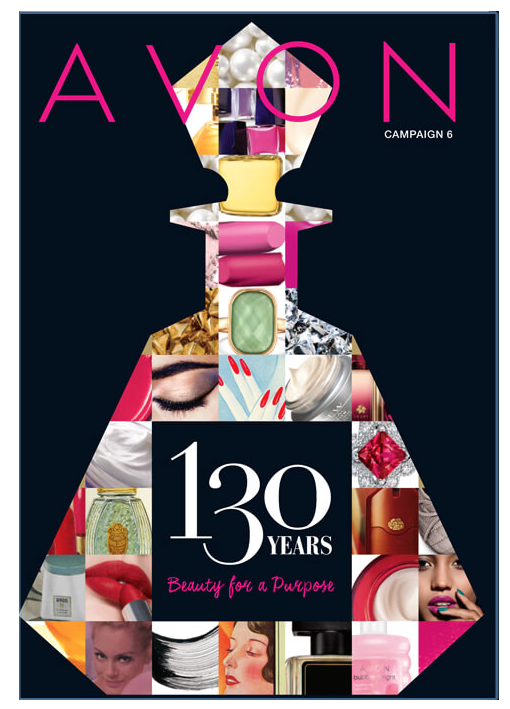 I’m looking forward to writing a hundred more! In honor of such a momentous occasion, I’ve been saving something special for you. My favorite food in the whole world is macaroni and cheese (or ‘Ronis and Cheese, as my little guy calls it). And I don’t discriminate. I love ALL macaroni and cheese, whether it’s frozen, from a box, or made fresh from the finest cheeses. I like it baked or creamy. I like it smothered with cheese and bread crumbs or not. Just give me any macaroni and some form of cheese and I’m a very happy girl. Today is a special day though, so a special macaroni and cheese is in order. And I’ve got just the thing to turn something sort of pedestrian into something elegant and worthy of a celebratory meal. That’s right… Lobster!! Lobster makes everything fancy. Now, once we throw lobster into the mix, we need to pay special attention to the cheese selection. Now would NOT be the time for American cheese or Velveeta. They’ve certainly got their place in the world of mac and cheese, but it’s definitely not here. Now’s the time for smooth cheese with grown-up flavor. I’m using three of my all time favorite cheeses; Gruyere, Fontina, and Brie. You can substitute other cheeses, if desired. Try gouda, chevre, provolone, asiago, or sharp cheddar. Our sauce starts as a basic Bechamel Sauce, which is simply a white sauce, made with milk that is thickened with a roux. (Check out my roux guide by clicking here.) The thickened milk is then seasoned with salt, pepper, and a pinch of nutmeg. Bechamel is one of the five French mother sauces, meaning that many other sauces can be made with a base of bechamel. To our bechamel, we’ll melt in the delicious cheeses. 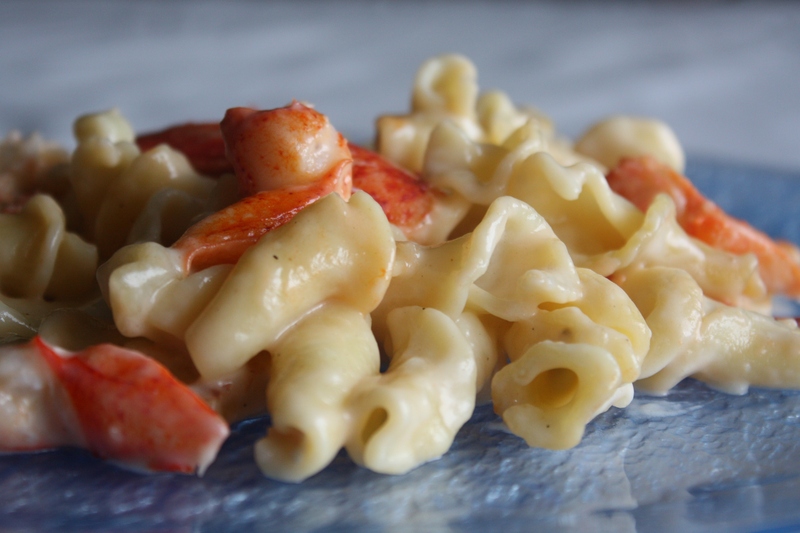 Finally, we’ll toss the macaroni with the sauce and warm lobster meat. If you feel like racing lobsters, go ahead and buy some live lobsters, steam them, and collect the meat. Or, do as I did and buy a container of frozen lobster meat. You grocery store may also sell lobster tails, which can be steamed. Before we get to the recipe, I want to let you in on a little secret. I made the macaroni and cheese on Saturday when we had people over. And I actually sort of botched it. Not a complete botch, but a definite error of convenience. My prime focus at the time, was on the burgers. My intention was to submit the burger recipe for a contest. So, I wanted to be able to devote all of my attention towards working out the timing and flavor balance of the burger components. Then the storm came, which totally turned the burger plan upside down. Anyway, I prepared the macaroni and cheese earlier in the afternoon and stuck it in a baking dish, figuring that I’d bake it in the oven to reheat with a little extra cheese melted on top. As I should have anticipated, the pasta drank up most of the sauce during the baking. It was still very flavorful, but not the creamy mac and cheese I’d intended. Never fear though. The recipe I’m writing for you does not include a baking step. So, your macaroni and cheese will be creamy and delicious. If you do want to prepare it ahead of time, I’d recommend tossing the pasta with just a bit of sauce. Then, refrigerate the bulk of the sauce and the pasta separately. You can reheat both and combine, along with the lobster, when you’re ready to eat. This is good, good stuff. If there were a way to send food through the world wide web, I’d send you each a taste and a glass of celebratory champagne. But since that’s not possible yet, I’ll share my recipe instead. Then you can whip yourself up a batch of fancy ‘Ronis and Cheese. Cook the pasta al dente, according to package directions. Drain and rinse with cold water to stop the cooking. Set aside. In the same pot that you cooked the pasta, whisk the butter and flour together over medium heat. Cook for 2-3 minutes, stirring constantly. This is your roux for thickening the milk. It should have a pasty consistency. Remove the roux with a spatula and set aside. Add the milk to the pot. Bring the milk to a simmer. Then, begin to whisk in the roux, whisking until smooth. Allow the milk to simmer with the roux for a few minutes until it begins to thicken. Whisk constantly. Add the nutmeg, cayenne, and salt. Turn down the heat to low. Add the cheese and stir until smooth. Taste and adjust seasoning with salt and pepper, if desired. Add the lobster meat and the cooked pasta to the hot sauce. Stir for a minute or so until it’s well combined and hot. I hope you’ve been enjoying this blog during these first one hundred posts. Let me know how you’ve liked it so far and if there’s any way I can serve you better! Thanks for reading! Posted in Cheese, Food, General Rambling and Such, Main Course, Sauces, Seafood, Things I Love and tagged cheese, Cooking, culinary technique, Eating, Food, food photography, kids, life, parenting, Recipes, seafood. Bookmark the permalink. That looks & sounds delicious!! Thanks for commenting on my blog! 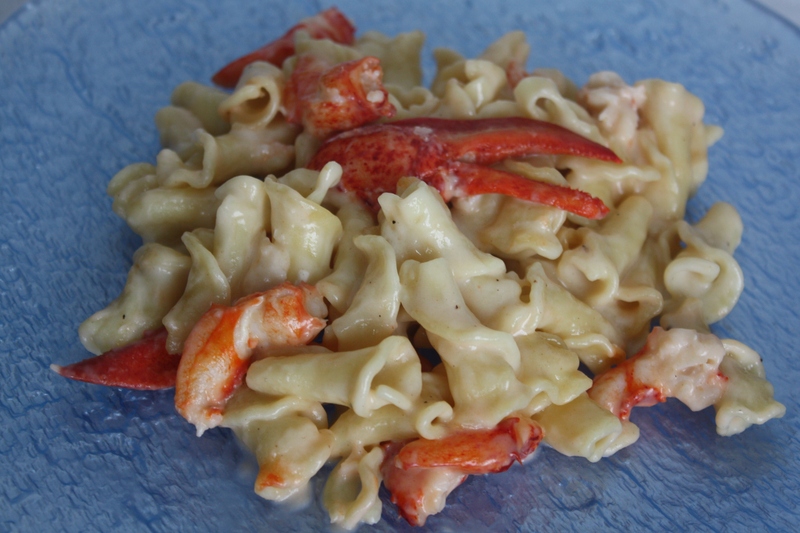 The lobster mac and cheese really IS delicious! Easy to make too! Um… everything about this looks delicious and decadent! I wish I had some right now 🙂 Great job! I am drooling. and saving this one for a special occasion. thanks! Elegant! Comfort Food! All in one dish! Now that’s my kind of eatin’…We are semi displaced at the moment, living in a travel trailer waiting for our new home to be built. This is definitely one of the first things I will cook in our new beautiful kitchen. 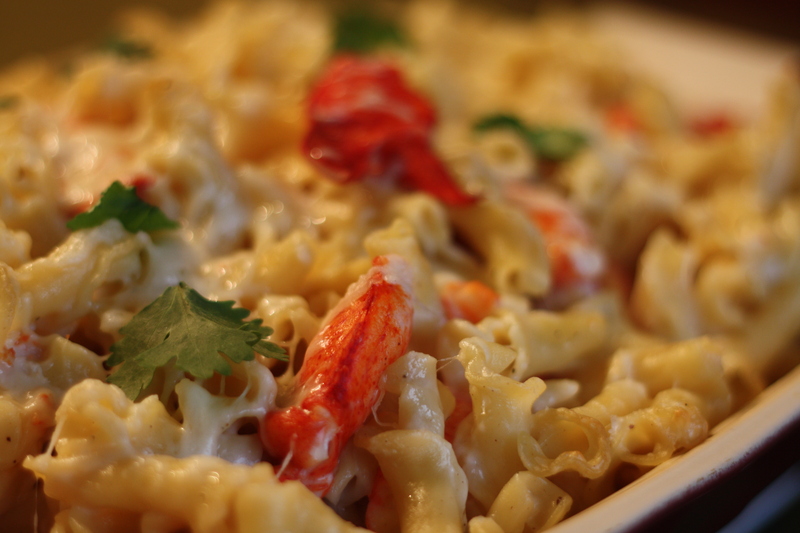 I had the most delicious lobster mac at a restaurant in Milwaukee once. This looks equally impressive. Made the recipe, but used cheddar instead of fontina. The results wer great – family enjoyed much. Thanks for posting!